So which is the world's most famous ski resort? Opinions remain divided and a truly international poll of public opinion has not yet been carried out. North American candidates would possibly be lead by Aspen with Vail and Stowe in contention or even the modern number one, Whistler. In Europe there's St Anton, Kitzbühel, Chamonix, Val d'Isère and perhaps half a dozen more, but given a mix of the ski world and the general public, wouldn't St Moritz come out top? Whether or not it is the best well known for the correct reasons is debatable, it's famous for being the playground of the rich and famous and for being a touch expensive, both of which remain largely true. On the other hand it's not well known for having great skiing, which it does. Some may also imagine it to be a quaint Alpine village, which it isn't, although the lakeside setting in the Engadin Valley is stunning. It is also not generally reported that, although a genuine traditional settlement, St Moritz is a high altitude resort with an excellent snow record and glacier skiing. Finally it should be mentioned that whilst many other famous names from skiing history have contented themselves to rest on their reputation, St Moritz and the Engadin Region have invested heavily in state of the art lifts and are now served by a host of high speed detachable quad and six seat chair lifts. Oh and the sun shines 322 days a year, Switzerland's sunniest spot. 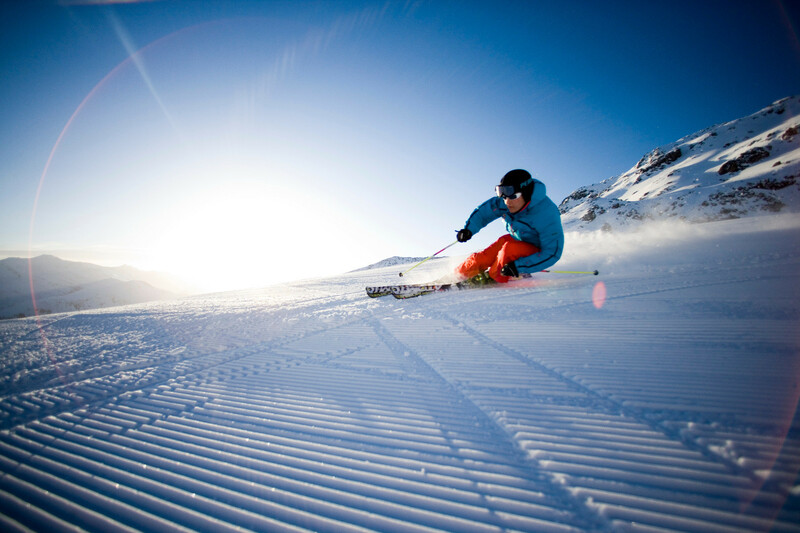 St Moritz can claim to be the birth place of winter sports holidays. In 1864 the owner of the Kulm hotel bet some English tourists a free stay if they dared to spend the winter there. They took him up on this proposition and the rest is history. St Moritz was reported in The Times of London a few years later when a guest recorded with surprise the flowers in the hotel window boxes on Christmas Day. By 1910 around 2000 guests spent the winter in the resort, most from Britain. Skating remained the most popular winter sport until the 1920s, with skiing dismissed as a serious sport by the locals, but then came the 1928 Winter Olympics and a new mountain funicular railway, followed soon after by Switzerland's second ski lift. The fifth Winter Olympics were staged in the resort once again in 1948. Later the rich and famous who flocked to St Moritz helped to develop the possibilities of glacier skiing on the Diavolezza glacier and later heli-skiing. In fact the resort can claim a long list of 'firsts' from opening Switzerland's first tourist board in 1864 and switching on the country's first electric light in 1878 to staging the first ice skating, curling and winter sports championships in the 1880s and even Europe's first golf tournament in 1890. St Moritz was the first resort to register its name and logo, in 1987. Finally, it must be noted that St Moritz's fame as a health resort does pre-date winter sports by several millennia. The first settlements are known to have existed here 3,000 years ago and the resort was also one of the world's earliest spa centres, well known as such by the time the Romans rolled in in 15 BC. Restaurants, shops, banks, post office, gas stations, nightclubs, and a cinema.